This is where I’m documenting my Whole 30 eating regiment as outlined in the book, It Starts with Food. For the next 30 days, I’ll be following a gluten-free, grain-free, dairy-free, sugar-free, soy-free, alcohol-free diet. 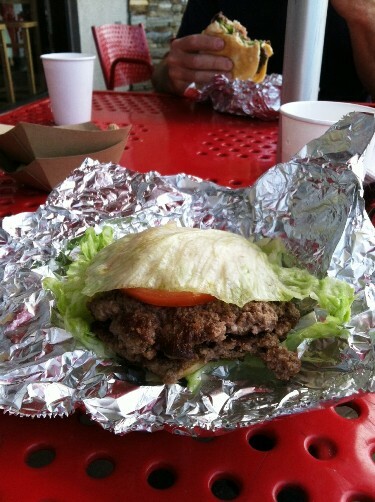 It’s called a Whole 30. My husband warns that it may be flavor-free. Here’s hoping that Mr. Right is wrong in this instance. I’ll be posting my food log here in a haphazard way. If you want to skip the whole daily diary thing, you can read my review of the program and conclusions here. 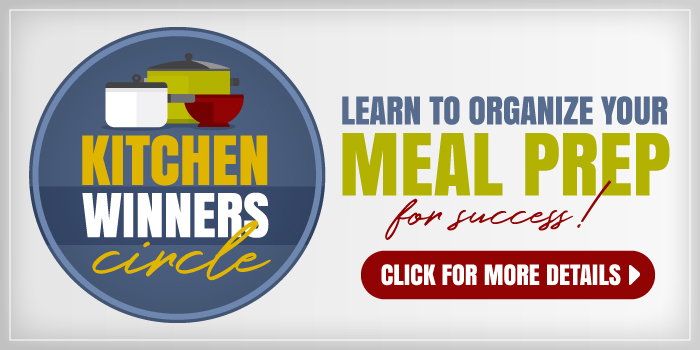 Available for a limited time: A Month of Protein-Packed Meal Plans – all your Whole 30 dinners (and possibly lunches) planned for you! 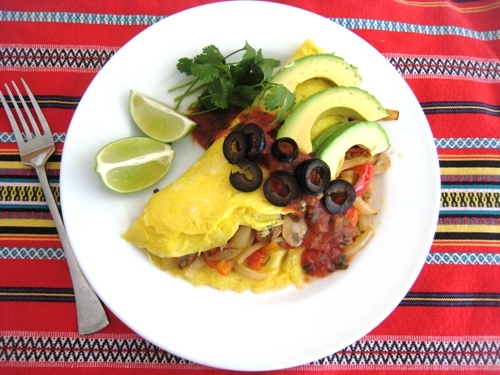 Breakfast: Fajita omelet with sautéed peppers, onions, and mushrooms, topped with salsa and about 1/2 an avocado. Small black coffee. Lunch: Sauteed chicken nuggets, seasoned with Jamie’s Spice Mix (NYM Make-Ahead and Freeze Cookbook), steamed spaghetti squash, Easy Slowcooker Red Sauce, broccoli di cicco. Water with lemon and lime slices. Dinner: Large dinner salad with roasted beets, avocado, carrots, tomatoes, green onions, cashews, nicoise olives, and leftover chicken that I cooked at lunchtime. It was even better cold! Making that again. Sparkling water with lemon and lime slices. Impressions: I’m glad that I researched this diet and did my shopping before starting. I also slowly started eliminating the things that I’m now avoiding. So, I wasn’t going to give my body a shock. I really didn’t eat all that different today than I normally do except that I would have added cheese to my omelet, snacked throughout the day, added cheese to my lunch and dinner salad, drank a glass of wine during dinner, and eaten a slice (or more) of pizza that I made for the fam. It’s love to make pizza that you’re not going to eat. It Starts with Food gives you a template for building your meals. It’s more than enough food! In fact, I was full before I ever finished a meal. I went ahead and finished (most of the time) since I knew I wasn’t going to snack in between meals. Boy, was it tempting to snack! I wasn’t hungry between meals, but I wanted to eat! Sweets, especially. A trip to Walmart was torture. It seems like there is candy at every corner. Which makes me wonder about our nation…. I bought a couple Larabars for emergencies during my grocery shopping earlier in the week. I don’t typically like them, but I figure desperate times may call for desperate measures. I’ll hold out as long as possible. 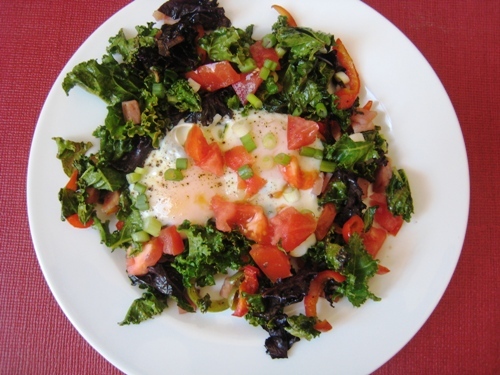 Breakfast: Monkey Salad; Skillet eggs with ham, kale, peppers, green onions and tomatoes. (After the fruit I was so full, I gave half the pan of eggs to my son.) Black coffee. Lots of water throughout the morning. Lunch: Salad with leftover chicken from yesterday, tomatoes, carrots, green onions, avocado, and vinaigrette. Water. Coconut milk latte after lunch. Dinner: I made roasted sweet potatoes as the starch in my taco salad, topped with seasoned taco beef, lettuce, tomatoes, guacamole. Another banana and cashew salad for “dessert”. Impressions: I awoke this morning with a pretty bad headache. That kind of surprised me. This is to be expected due to the “detox” nature of the program. But, I thought that I had slowed down enough on my cheese, bread, sugar eating to counteract it. No, I guess not. I reread their timeline. Yup. Just call me Charlie Sheen. Hubby asked me if I was going to do this forever. It’s too soon to tell. I probably could. It’s not that hard. At least not yet. I’ve found pleasure in plenty of new to me foods (like cashews and coconut chips) that I don’t feel deprived. I am always very full at mealtimes which I kind of like. I realize how mindlessly I eat, though. I had to remind myself not to nibble while I was making meals for the family. As a good chef should, I taste as I cook. That isn’t always good to do if I’m making a different meal for them than I am for myself. I’m looking forward to trying coffee with a little cocoa powder in addition to my cinnamon and coconut milk. I would love to break sugar’s hold on me, as good as it is. According to the timeline the coming week is going to get a little rough. Glad I’ve got freezer meals for my family and kids who can cook! 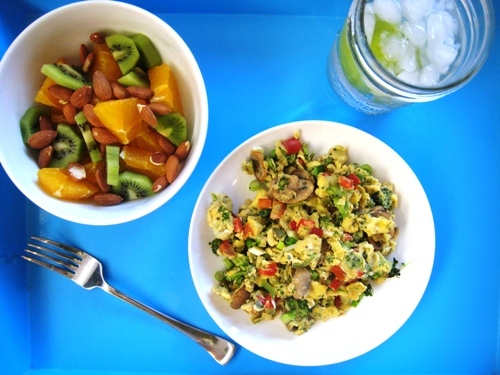 Breakfast: Vegetable Eggs Scramble (broccoli, mushrooms, bell peppers, garlic, green onions), Fruit Salad (orange, kiwi, almonds). Lime Water. Lunch: Taco Salad, take 2 with spinach, carrots, broccoli, green onions, grape tomatoes, seasoned taco meat, guacamole, and vinaigrette. A handful of cashews and a handful of coconut chips, followed by a banana later. 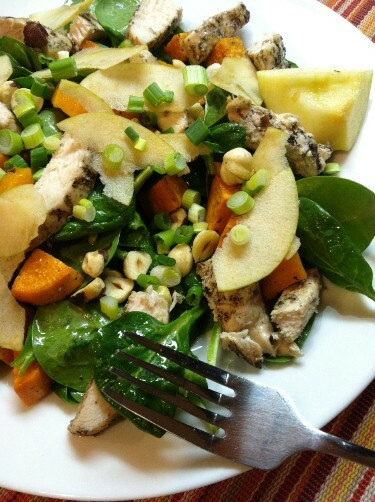 Dinner: Spinach Salad with grilled chicken, roast sweet potatoes and squash, green onions, shaved apple to remind me of cheese, toasted hazelnuts, red wine vinaigrette. Next time I’ll ditch the squash and use balsamic in the dressings. Impressions: I didn’t really have a headache today, just a dull roar every once in awhile. I didn’t drink as much water as I have other days. I should have though. I tried adding dried mint to my lime mineral water for a very fake mojito. Dried mint? No go. Wishful thinking. It floated on the top like leaves in a swimming pool. Ewww. Need to spring for some fresh mint or go buy a plant. I’m trying to give my breakfasts some variety. I got a great deal on eggs, so I’m being creative with them. But, I need to incorporate other proteins besides eggs. Gonna start looking for ham without all the additives. I love cashews and coconut chips. I love the batch of bananas I bought. Monkey Salad. Nuf said. Today I was definitely craving sweet, but I’m trying not to overdo on the fruits. That’s why I had sweet potatoes. Ha! My hips hurt significantly this afternoon. Kind of discouraging. Breakfast: Skillet Eggs, Monkey Salad. Black coffee. Lunch: Spinach salad with grilled chicken (I bulk grilled several days’ worth last night), avocado, tomato, hard cooked egg, and leftover squash and sweet potato. I tried balsamic vinaigrette this time, homemade, reusing the bottle. Lime water. 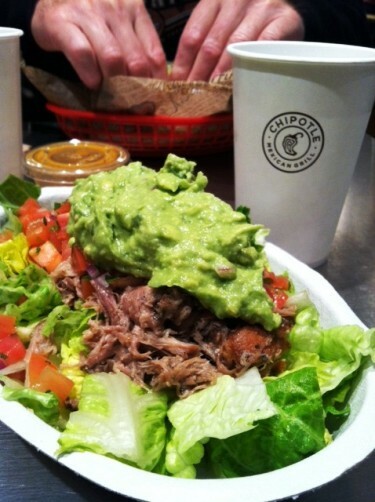 Dinner: Date night at Chipotle – salad with carnitas, guacamole, and mild salsa. A spoonful of coconut butter when we got home for a little sweet. Impressions: As you can tell by now, my interests in vegetables lean toward salads and leafy greens. I calculated how many meals worth of greens I would have left before I needed to restock. Trader Joe’s has some good mixes for a great price, so I timed it to land on date night. We did double duty of Chipotle and Trader Joe’s. A friend has encouraged me not to let yesterday’s pain deter me. It hasn’t been thirty days and the idea is that it takes awhile to get the offender out of your system. I will say that I do feel a lot more alert than I have in quite some time. The house is cleaner and I feel a little more with-it. I’ve also done a lot more label reading lately. There are hidden sugars in everything. Bacon for heaven’s sake! I know that sweet bacon is a nice treat, but I had no idea how difficult it would be to find sugar-free bacon that was also nitrate/nitrite-free. US Wellness Meats has it, but I can’t afford that. So, I’m learning a lot about our food supply through all this. As if I needed to learn more! I feel like The Girl Who Knew Too Much. There are so many hidden things in the foods we eat. Hidden things that probably don’t always need to be there. I did splurge on some sugar free, nitrate/nitrite-free sliced meats, namely proscuitto and roast beef so that I can mix breakfasts up just a bit. I’m getting a little weary of eggs. Edited to add: I had a Larabar (Chocolate Coconut Chew) with decaf after date night. I can’t believe I’m saying it, but it was really good! I wish I had eaten it sooner in the evening. It was probably a little too close to bedtime, about an hour or so. I woke up groggy and couldn’t walk straight. Not sure if that was the blood sugar issue, just a part of the diet to be expected, or the fact that I dreamt I drank a few swigs of hard cider and had a vicarious drinking binge. But, I did love the Larabar. I’ll be getting that one again. 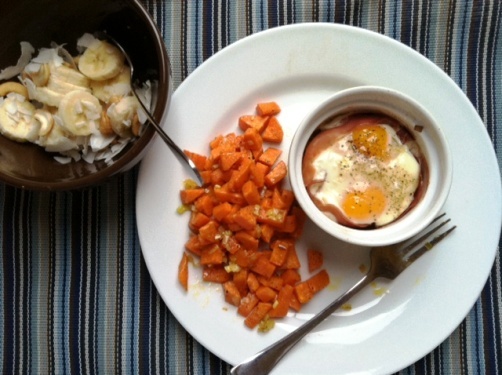 Breakfast: Proscuitto Egg Cup (without the cheddar), Roasted Sweet Potatoes, Monkey Salad. Coffee with coconut milk. 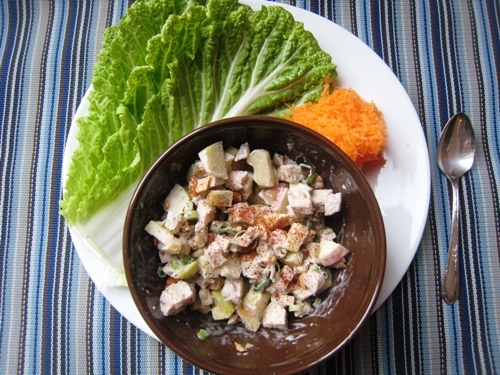 Lunch: Chicken Salad Wraps (chicken salad had chicken, apple, almonds, green onions, homemade mayo, and shredded carrot, all wrapped in napa cabbage leaves. Water. Dinner: Meatballs with Pork, Beef, Mushrooms, and Onions, Spaghetti Squash, Red Sauce, Steamed Broccoli. I made a salad, but didn’t need it so I saved it for tomorrow. Impressions: Today was tasty, but it was a lot of work. I think that eventually (soon?) I will come up with some quick(er) meal ideas and get on the ball with advance prep. If I had only known about this plan when I did my freezer cooking a few weeks ago…. Breakfast continues to be the challenge. My typical breakfast is very heavy on fruit, dairy, and grains. And I like my little food rituals, so that’s hard to get out of the mindset. This morning’s proscuitto egg cup was very tasty. I’d never had proscuitto, so I’d call that a win. I even tried my hand at homemade mayonnaise. I made a half-batch of this recipe, but used lemon juice instead of the vinegar. I imagine it will take awhile to get used to a different flavor than my beloved Best Foods. I’m kinda proud of myself for trying something new. So far it’s really fine. I don’t want to go bake Christmas cookies or anything. That would be hard, but I’m mindful that these alternatives to the regular stuff I eat are really good for me. I’m curious to see where this goes. 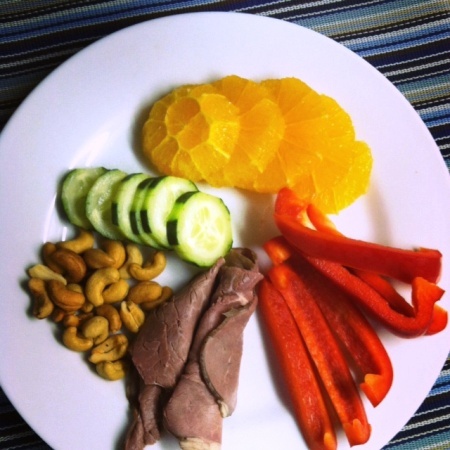 Breakfast: Snacky plate of roast beef, cashews, cucumbers, orange slices, pepper. Black coffee. Lunch: Skillet Eggs and Greens, avocado with vinaigrette. Water. Impressions: This is really not that hard — if you plan ahead. 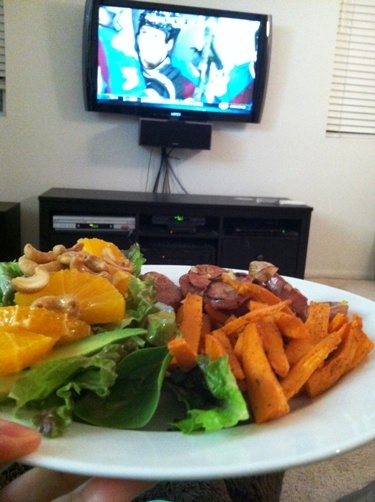 I didn’t mean to spend time in the kitchen on Wednesday; my meals were mostly premade. But, the produce box was coming and one thing led to another. I was in the kitchen for the bulk of the morning, often with several helpers. We cleaned out the fridge, roasted beets, made lemonade (for the kids), made vegetable trays, and otherwise futzed in the kitchen. Foodwise, I’m fine. I am more alert and sleeping much better. In fact I don’t need as much sleep as I did which is very, very weird. I can’t even sleep in if I want, because I’m sort of awake. Plus, all the water I’m drinking is making me get up. If not for a little cheese, chocolate, and wine, I could probably do this long term. It’s interesting, that’s for sure. Breakfast: Skillet Eggs with proscuitto, leeks, and Trader Joe’s Power to the Greens (baby kale, spinach, and chard), Monkey Salad. Coffee with Coconut Milk. Lunch: Salad with roast beef, tomatoes, bell pepper, carrots, avocado, cucumber, and vinaigrette. Water. Dinner: Almond-Crusted Chicken Tenders (The recipe is in my new cookbook which is very paleo-friendly. 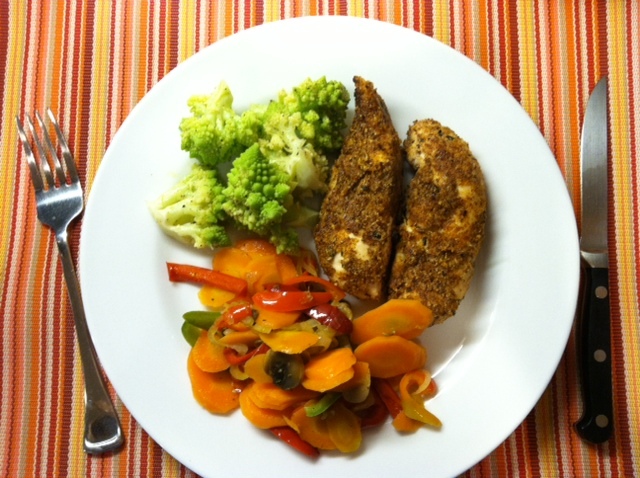 More than 2/3 of the recipes are gluten-free), Cauliflower, Sauteed Vegetables. Water with Lime. Impressions: Has it really been a full week? I had to do a double take on that. It’s becoming pretty natural now this Whole 30 gig. I am loving my meals, loving the new flavors. This food is definitely not boring. Tonight I cooked with coconut oil for the first time. I’ve used it in baking before but have been hesitant to use it on savory foods. I sauteed the vegetables in coconut oil and then pan fried the chicken. Amazing dinner. Amazing. Definitely going to make this again for the fam. I think the fact that I am eating ZERO processed foods and NO sweetener is really bringing my taste buds alive. I remember this from other times when I’ve eliminated certain foods. It seems previously subtle flavors get new life. I had hubby try the chicken tonight and he said the flavors were subtle, but good. So, I know I’m on the right track. I also am holding out hope that I might be able to limit our family’s general sugar intake and start making some more drastic changes for the better. I thought I was feeding my kids well before. But, now that I’m reading more labels, I realize that there are still some chinks in our armor. I’ve noticed that I’m better able to wake up the morning, something that previously was quite difficult. I have more energy than I did a week ago. Not sure if that is because of what I’ve taken out, added in, or both. Either way, I’m quite pleased. I’m tempted to stand on the scale, but they say not to. I know that my tummy doesn’t have as many rolls as it did a week ago. That is pretty exciting. 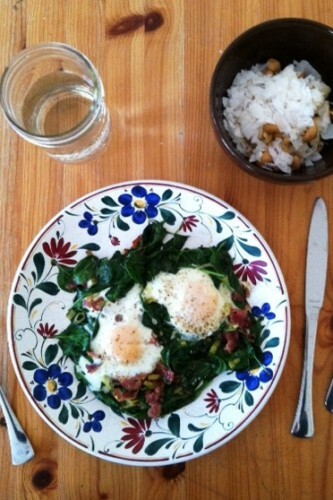 Breakfast: My favorite Skillet Eggs, today again with prosciutto, leeks, and spinach. My favorite Monkey Salad (coconut, cashews, and banana. Water. Coffee with coconut milk. Lunch: Leftovers from last night. Water. Impressions: So, I’m into the second week — and I’m surviving. It is, indeed, amazing. I feel good, I’m eating well, I’m not pouting. In the meantime, I’m keeping a stiff upper lip. This really isn’t that hard. I’m thankful to be able to eat so well and to choose exactly what goes on my plate. Not much of the world’s population has that great privilege. Dinner was good tonight, though I’m growing weary of making two meals every night. Next week will be different. I may choose to go over budget a little in order to make sure I have choices. Thankful that I went under last month when I least expected I would be doing this. Breakfast: Skillet Eggs, Monkey Salad, Coffee with Coconut Milk. 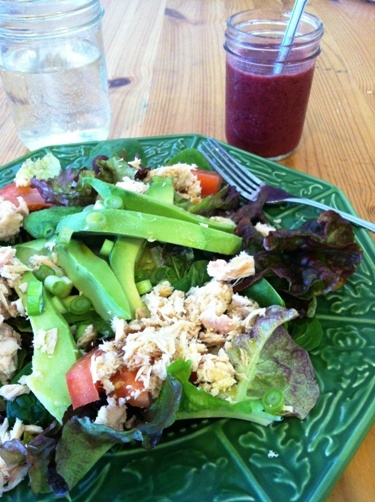 Lunch: Large Salad with tuna, egg, green beans, beets, tomatoes, olives, avocado. Water. Coconut Coffee and 1/2 Larabar for dessert. Dinner: Tri-tip, Mashed Sweet Potatoes, Steamed Broccoli. Water. 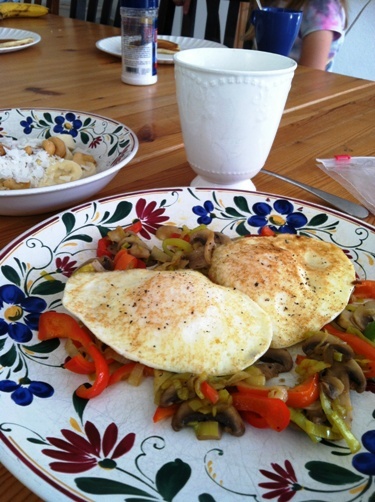 Breakfast: Fried Eggs, Sauteed Mushrooms and Peppers. Monkey Salad. Coffee with Coconut Milk. Lunch: Leftovers of Mashed Sweet Potatoes and Broccoli. Cooked Chicken from the freezer. Dinner: Roast Chicken, Sauteed Sweet Potatoes and Shallots, Asparagus. Impressions: I’m stunned that it’s been ten days already. I feel really good. I’m able to wake easily. Most nights I’ve slept well, too. Last night I stayed up late reading a mystery novel and kind of had my mind in another dimension. Plus, kids were up in the night. But, most nights, I sleep like a log. I did want to eat potatoes, bread, cheese, and a number of forbidden foods today. Instead, I went to Sprouts for more vegetables. I find that pretty funny actually. I guess that’s a good thing. Yesterday I bought the family baguette, per hubby’s request, for their lunches. That was a bit hard. And today I made them tostadas. I exercised great restraint on all counts. Most of the week, though I’m going to try to make our meals overlap more. It’s the ultimate in service to make mashed potatoes you can’t eat. So far, the benefits far outweigh the costs, though. I’m extremely thankful that my random comment on facebook two weeks ago led to a support group of women doing the same thing. It’s been so great to bounce things off each other and to help each other with sourcing. Amazingly helpful. Use the buddy system! Going into the week, I have my shallots and proscuitto all chopped and ready for the pan and a new supply of spinach, chard, and cashews to make my very favorite Skillet Eggs and Monkey Salad. 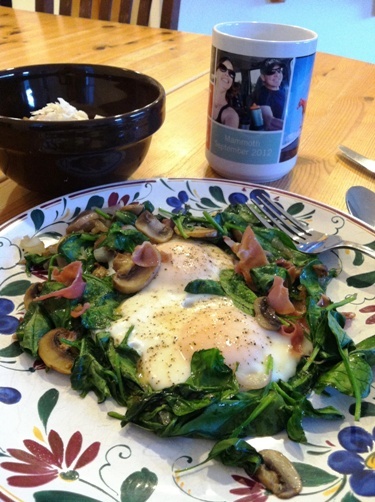 Breakfast: Skillet Eggs (with proscuitto and shallots), Monkey Salad, Coffee with Coconut Milk. Impressions: I am not afraid to say that the same breakfast everyday makes me quite happy. It’s like things are “normal” almost. And I do love eggs cooked on greens. I’m varying it with the aromatics, but overall it’s the same as the recipe. It is wearying making double meals for me and for the fam. As much as I wanted things to overlap, so far this week, they aren’t. I spent more money at Trader Joe’s tonight getting more options and easy meals for the kids. I am going grossly over what I like to spend. But, like I’ve said, we’re not eating out as a family. Just date night, so our dining budget is going toward more things to eat at home. I’ve been thinking about ways to reduce the kids’ intake of sugar. Having cut my own really shows me the difference. I would like to give them a chance at not being so dependent on it. Tonight I let FishBoy12 bake up the last cake mix we had. I’m going to purge the house of the junky sugar and then try to convert them to fruit and dark chocolate for dessert. And also move dessert backed up against dinner instead of so close to bed. Yes, we’re dessert people. And I’m okay with that. Only now my dessert is 1/2 a Chocolate Coconut Chew Larabar and a cup of decaf with coconut milk. Never thought I’d live to see the day. Lunch: Cumin-Scented Cabbage Salad with Roast Chicken and Cashews. Water. Decaf with Coconut Milk. 1/2 a Larabar. Dinner: Boules de Picolat, Asparagus, Chard with Mushrooms and Shallots, Berries and coconut milk. Impressions: So, I’m getting in the swing of things. I’m okay with eating the same thing for breakfast. Two weeks ago I was skipping breakfast or having a piece of toast or some yogurt. Now, I’m getting it down to a science. I make the same thing, basically, mixing up the aromatics and the greens, saute in a little oil, crack a couple eggs, cover and walk away. I make my coffee and Monkey Salad. And voila breakfast in twenty minutes. That seems like a long time, but it’s good and hearty. My hip/thigh pain is lingering. It hasn’t been terrible. I’ve rode the exercise bike almost every day, except today. And the pain was back. Sure wish I could figure it out. I have a fabulous support group on Facebook, including friends and fellow bloggers. They are the wind beneath my wings on this thing. We chatted about whether or not I should start omitting nightshades as well. Nightshades (tomatoes, peppers, eggplant, cayenne, and paprika) can cause inflammation. I’m undecided. That would certainly reduce my field of ingredient choices by a tad. But, it’s not summer so maybe I should just go for it. I’ve been out of ripe avocados for several days. I bought half a dozen on Sunday, but none are ready. It makes a big difference. 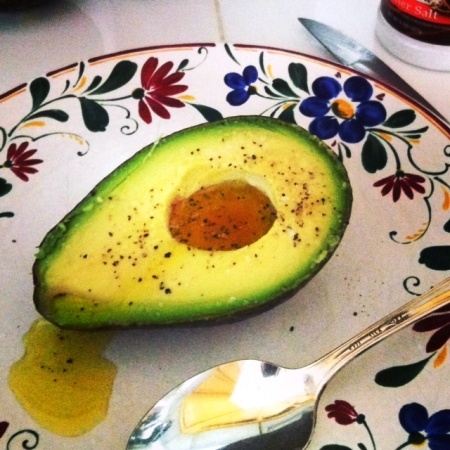 Adding 1/2 an avocado to my meals has really helped me fill up and hold out for the next meal. Today was really hard not to snack or have something sweet at the end of the meal. I broke down and did that at the end of lunch and dinner. Feeling like James Brown…. instead of Charlie Sheen. Thank you very much. Breakfast: The Same Thing, you guessed it. 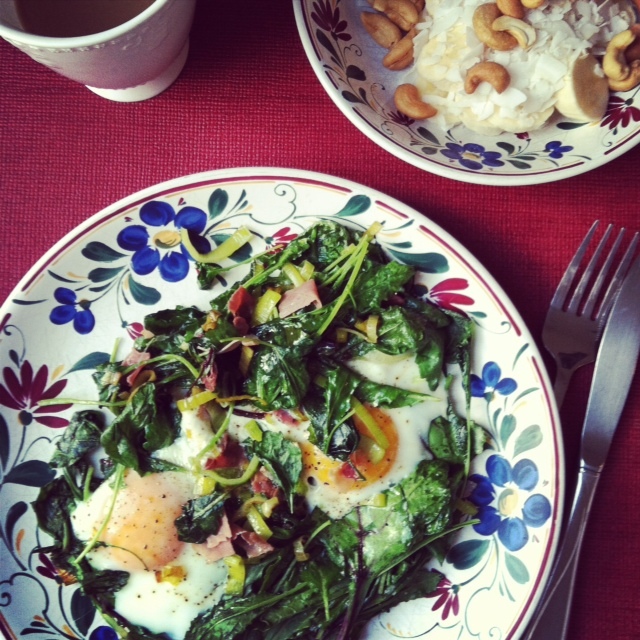 Skillet Eggs (with proscuitto and shallots), Monkey Salad, Coffee with Coconut Milk. 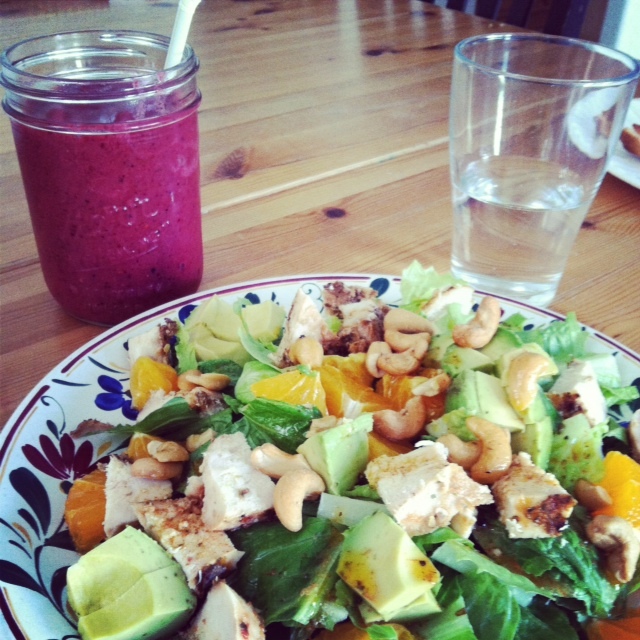 Lunch: Salad with chicken, oranges, avocado, cashews, and green onions. Amazingly good with this dressing. Breakfast: The Same Thing, you guessed it. Skillet Eggs (with proscuitto and shallots), Monkey Salad but I added a handful of blueberries, Coffee with Coconut Milk. Lunch: Repeat of yesterday’s lunch. Totally good. Dinner: Randomness: Steamed broccoli, leftover taco meat, a handful of cashews, a spoonful of coconut butter, a handful of blueberries, and a handful of coconut chips. Impressions: I look like I’m lagging, in part due to hormones. I guess this diet can’t cure all our ills, can it? I am nervous about my book signing on Friday and that is taking its toll as well. Looking forward to a new day tomorrow, my favorite breakfast, and salmon for supper. Lunch: Repeat of yesterday’s lunch. Again. But with walnuts. Dinner: Grilled Salmon, Baked Sweet Potato, Steamed Broccoli. Clarified Butter over all. YUM! Impressions: Hanging on. My energy is not what it was earlier in the week. I blame Eve. I think I’ll feel better after the book signing is over. Trying not to think about my favorite meals that I usually have when I go “home”. 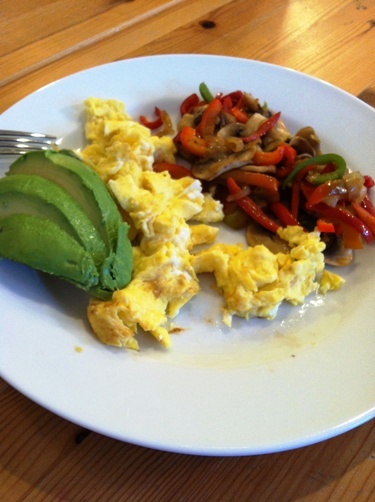 Breakfast: Scrambled Eggs, Avocado, Fajita Vegetables, Coffee with Coconut Milk. Impressions: This day we were out of town for the day. Breakfast was early, lunch was late, dinner was very, very late. Despite my communications with the restaurant before hand, I think I got some ingredients I shouldn’t have. The meat tasted sweet. I ended up with a headache and a seeming relapse of early detox symptoms. Bummer! In other news, this was the first breakfast my husband ever witnessed. He’s usually at work or asleep on the weekends when I eat. He asked me when I was going to go plow the other 20 acres. My meal appeared to him to be prime for a farmer. And this was a small breakfast! Ha! 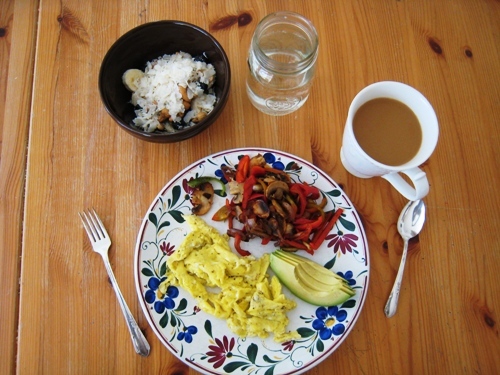 Breakfast: Fried Eggs, Fajita Vegetables, Monkey Salad, Coffee with Coconut Milk. Impressions: I felt pretty sickly/tired most of the day. I ran errands, grocery shopped, and read books with my kids. Impressions: I’m feeling a little miffed that I don’t feel good. This is supposed to be the stellar week. I think I had a relapse from whatever rogue ingredient was in my restaurant meal on Saturday. Feels like I’m starting all over again. And could one thing have such power? In other news, I really liked the white sweet potatoes. I had never seen them until Saturday at Sprouts. I only bought one to try, but wish I had bought more. They are closer to regular potatoes than the garnet “yams” that are really sweet potatoes with a fake name. (Thank you, America Marketers for confusing our lives even more.) The white ones are still “sweet” but not as sweet as the red ones. 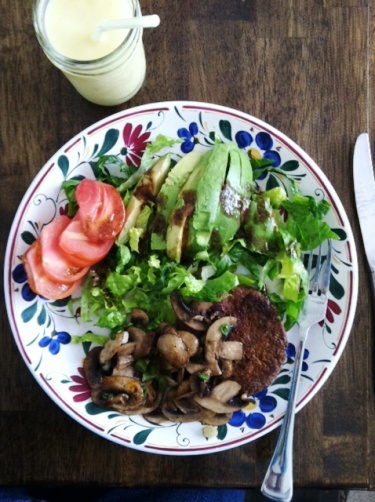 Lunch: Seasoned Beef Patty, Sauteed Mushrooms, Lettuce, Tomato, Avocado. Pina Colada Smoothie. Dinner: Meatballs, Spaghetti Squash, Green Beans. 1/2 Larabar. Impressions: I still am getting headaches. I think it’s from sleeping poorly. Like with a four-year old next to me. I started back to exercising today. I had stopped since someone suggested that my pain was from that. But, a week off that only makes me feel lethargic. Not really sure what my problem is. I’m still enjoying the food. If it weren’t for feeding my people things that I’d like to eat, too, I could do this forever. I’m glad I’m doing this. I’m learning a lot. It’s giving me clarity about how I don’t want to feed my family going forward. Like I think we need less sugar. 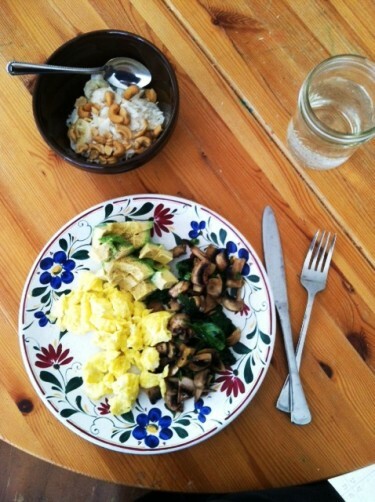 Breakfast: Scrambled eggs, sauteed mushrooms and spinach, avocado, Monkey Salad, Coffee with Coconut Milk. Lunch: Aidell’s Chicken and Apple Sausage, leftover spaghetti squash and green beans. Blackberry Banana Smoothie. Impressions: I’m 2/3 of the way through. I continue NOT to feel as marvelous as I did last week. The headaches continue, but the restaurant wrote back to say that there was no msg or sugar in the spice mix. I think it’s how I’m sleeping. Not much else to report. I’m ready to be done. But, I will keep at it. Lunch: Vegetable Beef Soup, Monkey Salad. 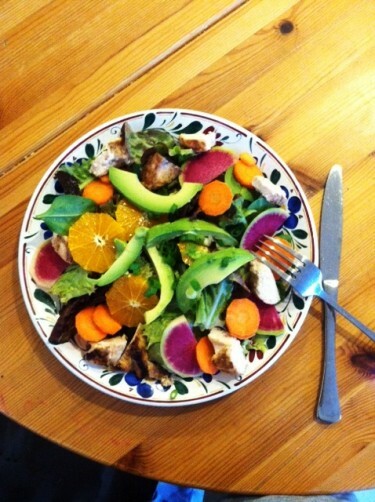 Dinner: Grilled Salsa Verde Chicken, Salad with Avocado, Oranges, Cashews, Scallions, Radishes, and Carrots. Impressions: I have no true complaints with this diet. The cravings are in check. I’m eating well. My hip pain, I think, is related to stretching and exercising. Someone suggested I stop riding the exercise bike. I quit for a week. The pains increased with a vengeance. I exercised (the shred) and the hip pains went away. I have other pain, but not those. Overall, I think this is a very healthy diet. I’m eating more vegetables than I ever did. I think that is one thing that all nutritionists agree on. I don’t believe that I’m eating that much more meat than normal. So, I have an improved opinion of paleo as a whole. I thought it was just a bunch of meat. If this is paleo, then I think some people are overdoing their meat and underdoing their veg. I see what folks post on instagram and know that they aren’t “doing it right”. I think they’re spending too much time making “legal” desserts, which I think misses the point. At least from my reading, it seems like the idea of a Whole 30 is to break food’s hold on you, not to find more things that you can’t live without — or create “legal” substitutions for those things. While I don’t plan to do this forever if I don’t have to, I hope that it’s giving me a better appreciation of food and teaching me moderation. One can hope. Impressions: I discovered that turnips don’t agree with me. It took eating them in my soup two days in a row to realize this. I couldn’t understand why my stomach hurt so bad, especially since I’ve eaten some of the same foods so often throughout this first three weeks. I am glad to discover that! If turnips didn’t show up in the produce box, I probably would not buy them. I guess they get added to the list of things to share with friends, next to parsnips and collard greens. Other than turnip stomach, I’ve been doing well. I have good energy and I am sleeping well. I haven’t figured out my body aches and pains, but at least it’s not for lack of trying. I’ve been doing some thinking about what I want to do on the other side of my thirty days. There’s a protocol for reentry. Day 31: Dairy (hello, yogurt, cheese, and cream in my coffee). On Day 34, I can add in gluten (hello scones, baguette, and pizza). On Day 37: grains (maybe rice and oats, but honestly, I don’t really care). On Day 40: legumes (meh. I honestly haven’t missed beans). Even though I am looking forward to some of my old favorites, I don’t want to abandon this new way of eating. I am sleeping better and am curious why. I do have more energy and I’d like to keep it. So, I don’t think I’ll go back to the same old ways. But, I would like to know that I could enjoy those things on occasion. Likewise, I’m reconsidering how I want to feed my family. 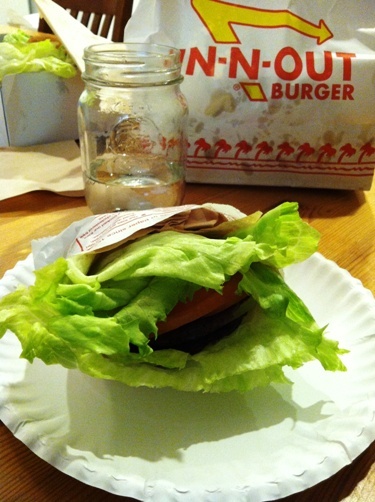 To eat for 22 days only “real food” is a pretty amazing accomplishment, if I do say so myself. I am trying to find ways that I we could afford better quality meats and dairy. I am scheming how to reduce my kids’ sugar intake. It’s been a good three weeks. I’m okay with it ending, but I don’t plan to abandon it, either. 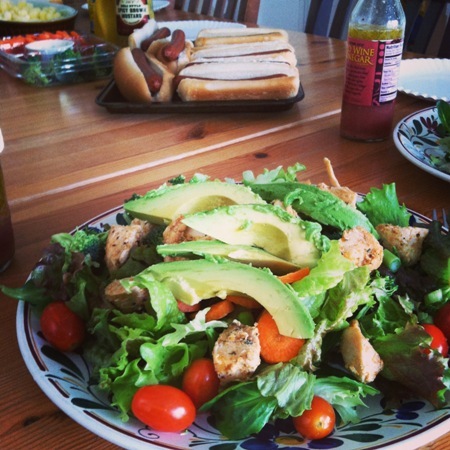 Lunch: Salad with Grilled Chicken, Tomatoes, and Avocado, Monkey Salad. 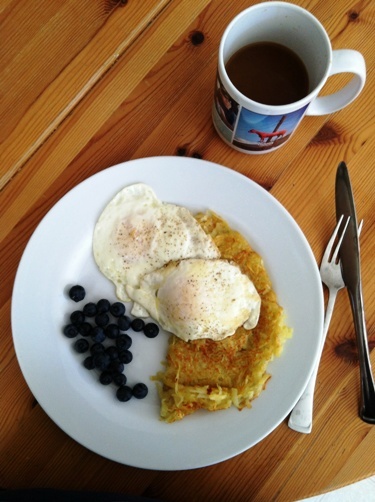 Breakfast: Fried Eggs, Sweet Potato Hashbrowns, Blueberries, Coffee with Coconut Milk. Dinner: Sauteed Sausage, Leeks, and Mushrooms, Leftover Hashbrowns, Broccoli di Cicco. Impressions: I have exactly one week left. The positives so far have been good sleep and a greater sense of alertness. On the negative, the body aches and pains haven’t gone away. Instead they seem to fade with regular exercise. Like my experience with the turnips the other day, though, I wouldn’t know that unless I was doing this strict diet. So even that is a good thing. At least I know what it is now. I am eager to get this down — and get back to the French trifecta (wine, cheese, and baguette). Here’s hoping they don’t make me feel bad. Despite my eagerness, I do plan to make some changes in our family’s diet. I know that I rely heavily on starches to fill everyone up because those are cheap. I want to up the fruits and veg some more and reduce our reliance on heavy carbs. I’ve got some ideas on how to replace/eliminate some of our sugars, too. Overall, this has been a great experience. I’ve learned a ton so far in three weeks. Here’s to a good finish. I’ve been in pretty serious pain for the last two days. My hip pain got worse somehow and has spread down my leg and around to my back. Clearly it’s not food. I even took out coffee as a last ditch effort to see if it was the caffeine. I confess, I’m discouraged. But, I’m glad to know what it’s not. That’s the plus side. I have an appointment with a new doc scheduled for the 1st as well as chiropractor on my list for tomorrow. It’s time to figure this thing out — before I worry myself to death. I’m sorry I can’t be more enthusiastic about this diet. I know there are plenty of folks who can and will benefit from it. I have learned a ton and I’ve slept well. So, that counts for something! That said, if it’s not helping with the thing I really need to get figured out, I want to have my bread and cheese! Oh and a glass of merlot. I’m going to stick it through the 30 days, and I am going to be more intentional about future food choices. Breakfast: Skillet Eggs, Monkey Salad, Water. Lunch: Sauteed Sausage, Mushrooms, and Shallots, Tomato. Dinner: Chipotle Salad with Carnitas, Guacamole, and Salsa, Water. Impressions: Today was my third day of constant pain in my hip. It was also my third day without coffee. Between my back, hip, and caffeine-withdrawal headache, I’ve been moving pretty slowly. I don’t have the Tiger Energy that I should have at this stage of the Whole 30, but there are extenuating circumstances. In light of those, it’s been harder to get excited about what I’m eating. And I’ve been craving other things that I didn’t previously. Shopping in Trader Joe’s tonight was really hard. Especially on the dessert aisle. In other news, I did go to the chiropractor. I found a chiropractic orthopedist who specializes in sports medicine. He was able to pinpoint all kinds of things wrong with me, right down to injuries that I had sustained probably in college. I knew exactly what he meant in checking the range of motion in my neck and jaw. He also had a diagnosis for my hip. And, yes, I wish I had gone last summer. But, oh well. Here we are. After few weeks of treatments, I should feel a lot of relief. Here’s hoping. In the meantime, I’m plugging away at the diet, going to finish it to Day 30 and then work on the reintroduction phase. Breakfast: Skillet Eggs, Monkey Salad, Water, English Breakfast Tea with Coconut Milk. Lunch: Skillet Meatloaf, Sweet Potato Hashbrowns, Spinach Salad, 1/2 Larabar. Dinner: Spaghetti Squash, Meat Sauce, Avocado. Impressions: Can you believe it’s Day 28 already? Wow! That went fast. I feel like I’ve “messed up” this experiment a bit. Since my pain was present throughout the month and turns out not to be food related, I think the “data” has been compromised. Aside from good sleep and energy, I really can’t report accurate findings since I’ve been in so much pain, particularly in the last week. I feel like three days of my life disappeared. I’m going to guess that the pain also has me craving my comfort foods, none of which are Whole30 approved. LOL. That said, I’ve learned a ton. I intend to do a sugar overhaul for our family in the coming weeks and months. I’m hoping to keep my meal rhythm going: regular meals, no snacks, no eating right before bed. I think that made a great difference in my sleep and energy levels. I have had lots of gas throughout this eating regiment (TMI?) and a fair amount of stomach upset, so I think that will compromise my findings next week when I reintroduce other foods. Impressions: I reached my thirty days. I’m totally glad I did it, but I’m also totally glad it’s done. I celebrated with five fries tonight. I figured six hours was close enough since I omitted lots of illegal foods before my official start date. AND the fries were white potatoes and cottonseed oil, not huge offenders. And I only ate five. I’ll be entering the reentry phase tomorrow with dairy. I’ll add gluten back in on Wednesday. Grains come back on Saturday. I’m sure sugar and a glass of wine might make it in, too. I’m going to be intentional, though, so I can gauge any weird reactions. I’m having sweet dreams about what to have tomorrow. I’m thinking: yogurt, Dubliner cheese, and cream in my coffee. See ya tomorrow! Ready for a Whole 30? If you made it to the end of this record, you deserve a medal! Considering doing a Whole 30? Then check out my list of recipes as well as my synopsis of what I learned. This post does include Amazon affiliate links. If you make a purchase through those links, I am paid a small amount in way of advertising fees. So, you’re almost done, right? How are you doing now? Hi Jessica–thanks for checking back! 🙂 I cut off my Whole30 at day 23. I went three weeks and I know this sounds lame, but it just became so stressful I had to stop. I felt a lot like you at the end–I just wanted it to be over. Not because I wanted chips or cookies or junk food–well, maybe some ice cream–but more because I was stressed out about every single thing I thought about putting in my mouth and that is not what the intent of the program is, so I weaned off. The positive side is that I’ve stayed relatively on the same eating path, except I’ve added dairy back and I have added a few meats in that I normally would not have been able to eat (namely, boars head lunch meat), but other than that, I am all grass fed or organic now. I am still consciously keeping sugar out of my diet–using natural fruits to sweeten things and I’m eating by the food template. I am not eating fast food or junky crap filler foods. I still feel really good and are reaping the benefits even with not being on the plan 100%. I’m glad I tried it, but I’m not sure if I’ll ever try it again. I can say for anyone else wanting to try it that it really does work and the only negative was the amount of stress I felt about food. I think you hit the nail on the head. It’s stressful to think about what to eat all the time. That wears on ya. The thing is, with a longer time on the diet, it becomes as mindless as what you were used to before. Like any other habit, once it is established it is hard to break…no matter what it is. Do you mean in terms of snacking? I am thinking of starting this up myself. Been having tons of allergy/lethargy issues. I’m desperate since the doctor isn’t the most helpful (more drugs!). I really really loved this compilation of your food. Gives me some great ideas and I really appreciate your attitude. You always look to the positive and talk about being grateful for what you have versus what you were missing. Thanks you for being so positive! Aww, thank you for such kind encouragement. I have been tempted to go back to the Whole 30 but I have mixed emotions. Maybe once my NEW doc diagnoses my hip pain, I’ll reevaluate. not sure if this is still active this site. I know for my hip pain and back issues once I gave up caffeine and started doing yoga 2 days a week my back and hips improved. I have done the whole 30 2 times. just a suggestion. Thanks! Yes, Yoga has solved most of my issues. I know this was written earlier this year but did you ever figure out what your hip pain was from and how to cure it? I have bursitis in my hips and it makes running, standing for too long, repetitive exercise, etc. EXTREMELY painful. Think, limping for at least a full day after & difficultly sleeping. I’m wondering if it went away what you did to cure it! The pain is driving me CRAZY! Still working out what it is. I recently had a MAJOR flare of sacroiliitis. My chiropractor is trying to figure out why the right joint won’t stay in place. Xrays with my GP show up fine. Right now my back hurts so bad, I can’t feel the hip pain. Hi Jessica. Just a thought on your hip pain. I have tried different elimination/whole food eating plans and had excruciating hip and leg pain for many years. Turns out I have an egg white allergy and the eggs were causing the pain. I noticed most days you are eating eggs…wonder if you might be reacting to them as well. Hi Cindy, yes, I noticed some bloating from the eggs, so I’ve been watching that. Too many eggs aren’t working for me. I’ll have to think on the egg allergy thing…. Last month both SI joints went out. Through a series of chiropractic visits, we determined that one leg is still shorter than the other (has been since childhood). This discrepancy finally caught up with me, I think. I’ve been wearing a lift in that shoe and my pain has been minimal if present at all. Thanks for checking in! I have done Paleo for a year, and do cheat a little. Wanted to try whole30 for the New Year to get me “back on track” and found your blog. I am sharing with a friend who may be interested in trying and I found your daily meals and experiences very helpful. I hope it helps her too. I read about your SI problems. When I was 17 I was in a motorcycle accident and dislocated my left sacroiliac joint and was in traction for 7 weeks, wheelchair for 2 weeks and crutches for another 2 weeks. After I would have excruciating shooting pains down my left leg from the joint. I feel your pain and hope that you can fix it. My left leg is a little shorter now than my right leg, but the pain has gone away after healing and I thankfully have had no recurrence. The doctor said my pain was from the nerve that runs through there and I don’t know if it got pinched or damaged, but the pain was horrible! 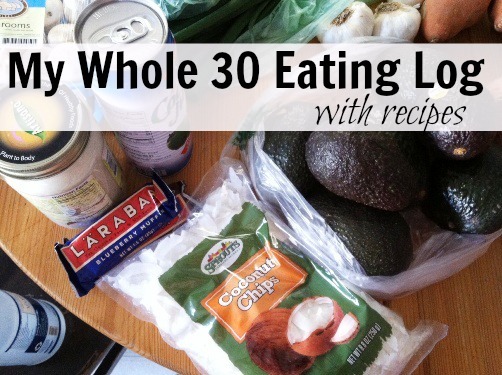 Good luck with your Whole30! Glad you found Good Cheap Eats. We’ll be chatting about eating goals next week. Hope you’ll chime in. You have Ankylosing Spondylitits and should cut out starches. Read this for the Whole 30 insight, but wanted to comment about the hip pain…I had terrible hip pain that also triggered sciatica and after a year and multiple doctors I finally found relief by doing pilates (reformer) with a very well trained instructor. Turns out I had terrible alignment issues and my weekly tune up seems to keep it all in check. I’m guessing this is an old post so hopefully you’ve found something that works for you! Thanks for the input! Yoga is what I’ve found to help, so similar to pilates. Cheers! Good luck! It was a great experience. I plan to do it again, just need to wait until my cooking projects are behind me. Hello, I am thinking of starting this Whole30 thing on January 1st. I already eat pretty healthy as it is but want to try and nix the dairy/grain for a month before my trip to Mexico. One question I have is what about snacks? So you have 3 meals a day and can you have 2 snacks in between? I also workout everyday so am I able to have pre and post workout snacks? That is my main concern. Thanks for any input! I definitely recommend reading It Starts with Food. That explains all about snacking as well as workout snacks. Have you tried adding lots of gelatin to your diet to help with your hip pain? You can make homemade bone broths or buy powdered gelatin. They have a powdered source from grass-fed cows that you can buy. My sisters and I have all suffered with various joint pain- knee pain for me and hip and SI joint pain for my sisters. Daily gelatin intake helped tremendously for us. Good luck! Let me know if you need help adjusting recipes to be compliant. I think I reported it in the “what I learned post”, but I really did not lose much. In fact, my clothes were tighter at the end of it than when I started. I think that I was bloated due to all the eggs. My weight fluctuates the same six pounds, and that’s what it did for the Whole 30, too. I didn’t see any significant shape changes, though I was more alert and had more energy. Hi, thanks for posting, I’m also blogging my little adventure on my webpage and am on day 13. The ONLY reason I am doing this is to lose weight. I understand that I should want to live a healthy lifestyle, etc, etc, but I really need to lose this excess weight I’ve been keeping for the past 2 years and this was my drastic food change to make that happen. I’ll be very bummed if I lose my 6 fluctuating only, my goal was 10 or more. Do eggs cause bloating? Thanks again, I’ll be referencing your food recipes here for idea. In my experience eggs cause bloating. If it’s an encouragement to you, know that my dad has lost 24 pounds since Feb 2 doing this diet. I just scanned through your Whole30 experience. Well done on your success! I noted your comments about hip and back pain and I just wanted to share my experience of 8 years or more of “unexplained” back and hip pain that every physio, chiro, osteo, accupuncturist etc had a diagnosis for, however it never went away. Thankfully for me I have discovered it IS gluten and dairy that cause my symptoms. Some people are affected by eggs and nuts in this way, and I noticed that you started to eat eggs everyday and your pain got worse? Just thought it might be helpful to point out? The way I found my sensitivities was with a pretty strict elimination diet recommended by a naturopath. Each phase only really lasted a week and if you had no reaction to something then you could move onto the next. The foods that were targeted were; Gluten, Eggs, Dairy, Soy and Nuts. Obviously sugar, caffeine and processed food were also avoided. I just thought I would share. I can definitely related to eating out and the staff saying a meal is gluten and dairy free, yet the pesky pain comes back for a week or more until I get whatever it was out of my system. Not sure if this is helpful or not, but I felt compelled to comment. I’m in the middle of my first 30 and have been reading your blog for ideas and recipes, however as a physical therapist my interest was also drawn to the painful situation you’re having with your hip! 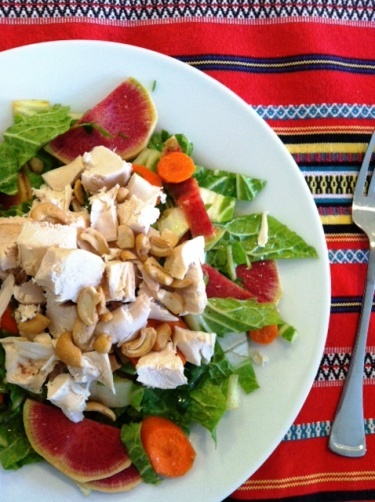 As your blog has helped me tremendously with my diet (thank god for Monkey salad! )I wanted to offer my help with your hip pain. I am a physical therapist in the LA area and have lots of experience with women and SIJ dysfunction, and am more than happy to offer any help I can. Please feel free to email me if you have any questions or want to bounce ideas off of someone- it’s the least I can do for the great info you share with us!!! Have you found any relief from hip pain? Please share, I suffer with the same thing. I’m not sure if your question was directed toward Jenni or me…. I have found that regular yoga has almost completely cured me of the pain. I take classes at my local YMCA, but there are plenty of videos out there. Hi Jessica! Thanks for all of your great meal ideas. I just started the program yesterday so this was very helpful! I was wondering though, what types of dressings did you put on your salads, if any? The program includes a lot of salads and I am weird about eating drug salads. Balsamic vinger typically would do it for me, but the vinger I continue to find has sugar in it. What did you do?? What do you saute your vegetables in? 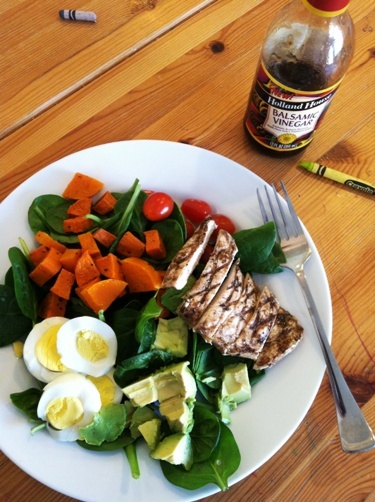 During the Whole 30, I used mostly coconut oil or olive oil. I made ghee once but that was too much work. 1) “I’m looking forward to trying coffee with a little cocoa powder in addition to my cinnamon and coconut milk. I would love to break sugar’s hold on me, as good as it is.” I’m a huge cream-and-sugar coffee drinker and would love to break that hold, but I know I can’t go straight to black. What was your favorite way to drink your coffee during your Whole 30? Do you still drink your coffee that way? I followed you when you went through this, and now am re-reading for some inspiration! 🙂 I don’t know that I could do the entire Whole 30, but I’d like to cut back on a few things. I liked having my coffee with Trader Joe’s light coconut milk. It was the only one I found without additives. I seemed to enjoy it most (before and after the Whole30) when I drank it alongside Monkey Salad or something else that was sweet. I have not gone back to adding sugar to my coffee, but use dairy cream or half and half because that’s what I buy for my husband and I don’t want it to go bad before we can use it up. Cost is tricky. I think we spent a lot more food that month, but part of that might be because I was cooking two meals every time, and buying the groceries for two meals. If I had made the same thing for everyone, it might have been different. I am currently going to a “cleaner” diet, less processed and no added sugar. That is pricey, too. Funny how cheap sugar and processed meats are in comparison to the real deal. Thank you for your meal plan. I’m using a lot of your recipes for my upcoming Whole 30. Great! I’m starting a new one tomorrow! Will be posting new meal plans, grocery lists, and recipes. Hi Jessica, I am thinking of trying this because the last 30 days I gave up sugar, flour, coffee, and splenda. I feel so much better than I did before, and all of my cravings are gone. That being said, I still feel a bit sickly and bloated, and I have not lost much weight maybe 4 pounds. I am obese (270 5’3″) and I would have thought that giving up all of those things, not to mention all the bingeing and the fast foods I stopped would have cause a lot more weight to come off so I don;t understand where I am goin wrong. My sister and my dad have both struggled. For my sister she’s lost about 50 pounds getting rid of gluten and sugar. My dad has lost 12 pounds on his Whole 30 and is feeling really good. It might be worth a shot! Yes, I make my own salsa. Recipe is here: http://lifeasmom.com/2010/12/homemade-salsa-a-giveaway-from-muir-glen-reserve.html I’ve bought ghee at Trader Joe’s. So sad to discover that Chipotle uses soy in most meats. It has been my go-to place to eat. Hopefully no more carnitas shortages in sight. Out here they’ve transitioned to rice bran oil instead of soy. How did the reentry phase go? I’m still within my initial 30 day period. Where are you now (several years later)? It was another year before I started yoga and that solved my hip pain. I never had sensitivities to food, but still try to eat clean more often than not. I think unprocessed foods is the way to go. Hi. I’m wondering; did you lose weight? Inches? I’m thinking of doing this but it definitely sounds like work. Just wondering if it paid off as far as weight loss. Thanks! I’m so glad to hear it. Congratulations! Yes, my more recent posts reflect that. But, 2 years ago I didn’t know how to spell it. I haven’t had time to go back and fix it all, but I’ll add it to the list. Thanks for the reminder. Well, I’m on day 5 with my wife. Having a little issues to what to make each meal but managing it. Need to plan ahead better but I’m sure I get better at that. Day 2-4 I had the hangover they are talking about. Headaches that lasted all day and just being tired. However, I have been sleeping deeply for the last 3 days!! No dreams of cakes or ice cream but other off the wall dreams but it’s all good. Today however, I’ve been a little moody and little things are aggravating me but no headache. 🙂 Hopefully this won’t last too long. One thing for sure, even at day 5, my appetite has been at bay. I haven’t eaten as much and I am satisfied until the next meal. Not like before that I eat a plate full of carbs and than be hungry an hour later. Happy about that as well. Wish all of you luck. I’ve got a meal plan here: https://goodcheapeats.com/?attachment_id=15745 Maybe it will help you out. Hang in there! i have recently been put on a strict diet by my doctor. gluten free, diabetic friendly, low to no lactose. she thinks i am gluten sensitive, prediabetic, and lactose intolerant. so for me it is not a 30 day change but a life long change. i have substituted splenda for sugar and it will do, i cant stand coconut in any form except a cake, lol. i adore eggs but already have mildy high cholesterol. so i can only have them once a week. i have not had headaches or any kind of with draw from my new diet and have been on it for a week. but it is really hard to find things i CAN eat. i am also on a strict budget. less than $100 a week to feed whole family. can you make some suggestions? i am tired of pears and lean tastless chicken. please email me any tips. thanks. 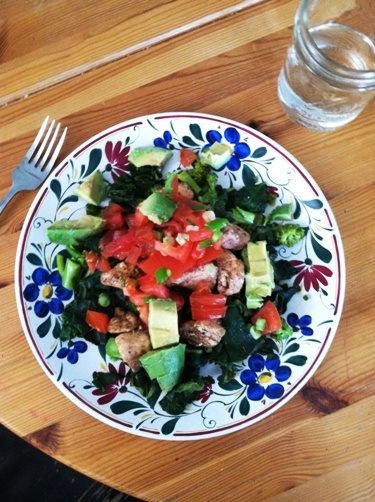 Such a great blog post and so many inspiring meal ideas. 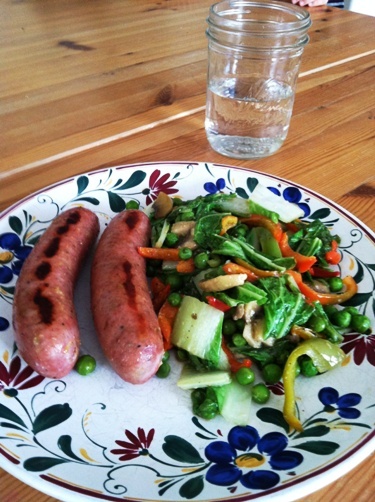 I’m embarking on my second whole 30 (must be mad right!) and it’s funny how natural eating this way again feels. Reading your above comments, I agree that the most stressful part of the whole 30 is planning what you will eat everyday. It’s almost like a part time job! Good for you. My second round was harder for me. I didn’t get the burst of energy at all, my husband thinks that’s because we eat so clean all the time, there wasn’t much difference. Good luck! I want to start this but does it work? I want to lose 10 pounds so please tell me. My dad has lost over 20 pounds doing it, but I didn’t lose any. Go figure. He’s been doing it since February. How wonderful for you! — I just found this website and it is such a good inspiration. So much useful advice. Jessica Fisher, I really appreciate what you are doing. Hi! I stumbled upon this old post and I am considering giving the Whole 30 a try as I am gluten free and I often find it hard to keep my eating clean. However, the only meats I eat are chicken and turkey. Do you think that making meat substitutions or eliminating it altogether in some recipes with adversely affect the design of the program? Thanks! I don’t think it’s a problem to eat only white meat during the Whole 30. Thank you thank you thank you!! I was trying to find a good, concise place to find a variety of meal ideas and your blog was perfect! When I first saw the skillet eggs I wasn’t so sure, but have made them with shredded brussel sprouts and onion – SO GOOD! I’m starting to crave them! Also tried the monkey salad today and it’s going to be another favorite as well. I am easing into the Whole30 right now, trying to make better choices (we have a couple out of town trips and things in the next couple of weeks so I am going to wait to go full on). So glad you like the Skillet Eggs! One of my favorites! Good luck with your Whole30! I love your menu ideas!! Thank you for taking the time to post all these wonderful recipes and ideas! I will be trying the Monkey Salad very soon!! Yes, Chipotle has moved to rice bran oil since I did my whole 30 in 2013. The Whole 30 people have also adjusted their rules on cooking oils while eating out. Should be much easier to do now. A couple hints. Avoid all sausage, you mentioned you did not feel well. Gluten is hidden in the “natural flavors”, so is yeast. I have yet to find sausage I can eat. Second, Never eat fruit with other foods, such as eggs. It sits on top of the food in the stomach and slows down the digestion. Can be eaten with nuts, but very few other things. Cooked fruit is different, but still should be avoided with most foods. I am likely going to do the whole 30 in a couple of weeks. I LOVE your daily posts and most of your recipes look really good. Question, you mentioned you tried to ween yourself a little a couple weeks before you took the plunge. I’m thinking of this a little took, but curious you have written about that or what you did do? No, I didn’t ever write about it. A lot of the Whole 30 meals are those that I would eat anytime, so the week beforehand, I just incorporated more of those things and made a conscious decision to say no when sugar or whatever wasn’t all that tempting. Sometimes we eat because it’s there, you know? I tried to start making more conscious choices. I just wanted to thank you for going through the effort to create this food diary. This had to be a lot of work and I as I prepare for my whole30 it is a invaluable resource (along with the other posts). It is giving me peace of mind as I plan out meal ideas and craft menus. Thank you so much!! Oh my stars Jessica! 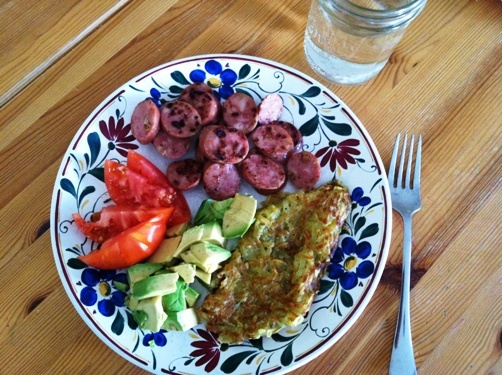 I have spent the last few hours reading more about Whole 30…and your blog/posts/recipes rock! I tried my first W30 with a support group from church in Feb…..bought the book (everyone should…it helps), It Starts With Food. I made allot of discoveries and allot of mistakes but overall a good experience. I lost about ten pounds but I felt so much better. I consider myself a “green eater” and have an autoimmune issue so it is important to pay attention…but this was an eye-opener because I realized how much more I had to learn and pay attention to! I found your blog to be my favorite…your honest evaluations and observations are very helpful and encouraging…so thank you so very much! A few things: Costco has a bag of shredded mixed greens (kale, Brussels sprouts, spinach) that make your breakfast eggs terrific! Whole Foods (and Harris Teeter in the south) sells large plastic containers of already cubed sweet potatoes and acorn squash…I buy them every week to be roasted with Persian lime olive oil or added to soups or stir fry in coconut oil for hash…yummy with eggs. I just ordered your cookbook so more thanks! Getting ready for my second W30? Thanks so much for your kind words! 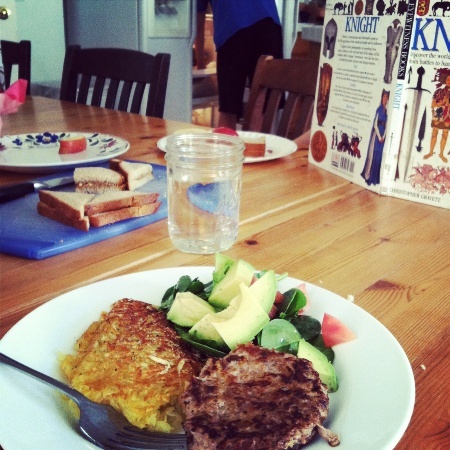 Keep in mind my cookbooks cover a range of diets, but are easily adaptable to Whole 30. And yes, I’ve bought a similar salad at Costco and realized it would go great in eggs! Great minds. Good luck with your next Whole 30! Thank you so much for sharing this. I’ve been contemplating going on the whole30 for months now but always chicken out, thinking there wont be enough time or it’ll be too expensive. But this makes it so much more approachable, especially with the freezer meals! So happy about finding your post! Hi! Love the recipes, thank you! I wanted to mention something about hypothyroidism and veggies and fruits. There are about 10 items that must be cooked a bit before consumption and kale, spinach and strawberries are a few. These have goitrogens which block the thyroid meds. I make a green drink and I use kale and spinach but make it into soup in my blender first, then add all other ingredients. This helps me so much when I get stuck on figuring out what to eat! Thank you so much for posting everything!!! So glad it’s a help to you! Just started yesterday and have it’s already been somewhat hard with all the meal prepping and time that goes into thinking about what my next meal is going to be. Thanks for all the great meal ideas! Where did you get your kitchen table and plates? How is your table not banged up with all of your kids. I have two 6 and under, two cats, a dog and a pine Pottery Barn table. It is scratched everywhere. Anyway, I’m admiring your table. Haha! It’s an UGLY pine table hand-me-down from my inlaws. It’s got paint and gouges in lots of places. Maybe they just aren’t showing in the pics? Bought The Whole 30 at the beginning of the year but husband had heart surgery in March. So just now going to go for the 30 days. Starting in August I’m going to start to weed out the milk, grains, legumes, and sugars. Then by September start the my 30 days. I was wondering is there a list of certain brands that are whole30 approved. Since manufacturer’s change their formulas from time to time, it’s always a good practice to read labels each time. That said, I’ve had good experiences with Costco Kirkland tuna and chicken broth, Trader Joe’s tomato sauce and coconut milk, Aidells Chicken and Apple Sausage, and Koops Dijon mustard. Hope that helps! you eat just 3 times a day??? and do you snack? how many hours between every food? There are no snacks on the Whole 30 unless you do a heavy workout. Three solid meals a day otherwise. Thanks for sharing. What ended up healing my hip pain was actually yoga stretches, but this is interesting to know. Thank you so much for this blog. I am doing the Whole30 with my sister starting tomorrow. I can’t wait to see if it helps with my tiredness, joint pain, and blurry vision. I just have to eat to live not live to eat. 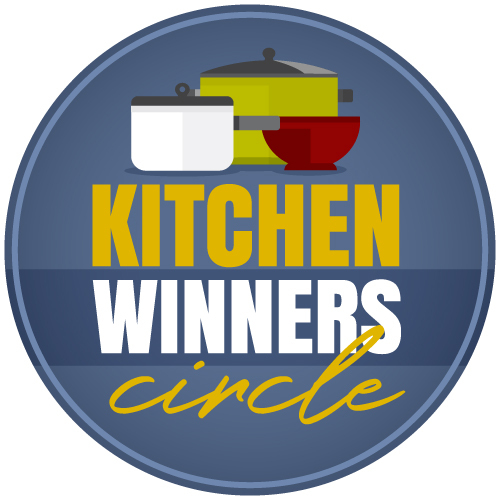 I appreciate the daily entries and the recipes and menus. I don’t feel so overwhelmed as I did when I signed on. Going to the grocery store next. 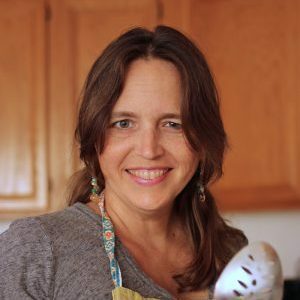 Check out my meal plans here, too: http://fishmama.com/product-category/meal-plans/ The first two listed are Whole 30. 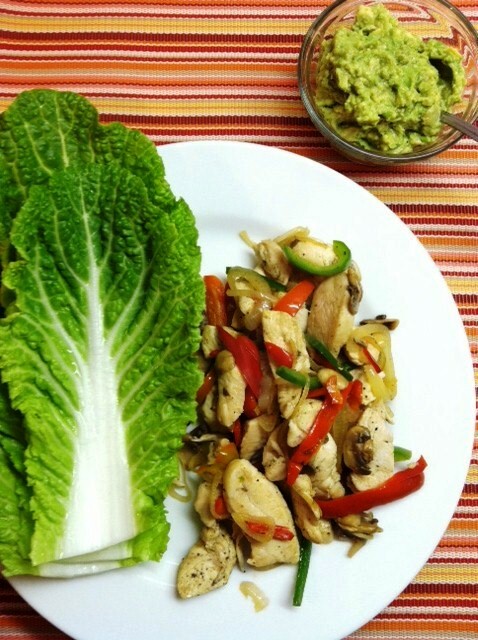 Thank you so much for sharing your Whole 30 Diet Menu!!!! This has been very helpful!